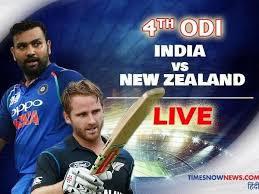 You are here for India vs New Zealand 4th ODI live of India tour of New Zealand 2019 has been played on Seddon Park Hamilton on 31st Jan 2019. Rohit Sharma, Shikhar Dhawan, Shubhman Gill, Ambati Raydu, Kedar Jadhav, Dinesh Kartik, K Khaleel Ahmad, Bhuwneshwar Kumar, Yazuwendra Chahal, Hardik Pandya, Kuldeep Yadav. India has had won all 3 matches of this ODI series. 1st ODI, 2nd ODI, and 3rd ODI. Rohit Sharma is playing as a captain in absence of Virat Kohli. Shubhman Gill is debuting from this 4th ODI. There are so many crickets series have been played in this season. Such as Sri Lanka tour of Australia, Pakistan tour of South Africa and England tour of West Indies 2019. All the teams are preparing them for Cricket World Cup 2019. India is struggling for a good total after losing 5 most important wickets at 33 runs. These wickets were of Shikhar Dhawan, Rohit Sharma, Ambati Raydu, Dinesh Kartik and Shubhman Gill. India all-out at 92 runs in 35.5 overs. Yazuwendra Chahal scored a maximum of 18 runs in this match. Trent Boult got 5 while Grandhome got 3 wickets in this India vs New Zealand 4th ODI 2019. India scored 2nd lowest score against New Zealand after 88 in Dambulla in 2010. The target to win was very low. So New Zealand got it easily in 14.4 overs for the loss of 2 wickets. Martin Guptill started the inning with a blast. He smashed 4, 6, and 4 in 1st 3 bowls of very 1st over of New Zealand inning. Ross Tyler 37* runs with 2 4s and 3 6s. While Henry Nichols scored 30* with the help of 4 boundaries and a six. Only Bhuwneshwar Kumar could get wickets for India. He got 2 wickets. New Zealand scored 93/2 in 14.4 overs. And won this India vs New Zealand 4th ODI 2019 by 8 wickets.